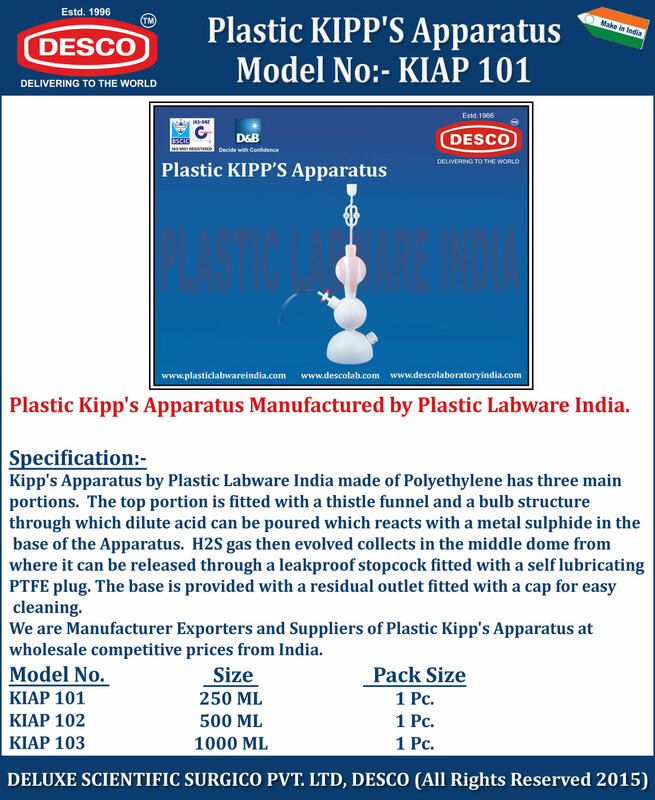 Kipp's Apparatus by Plastic Labware India made of Polyethylene has three main portions. The top portion is fitted with a thistle funnel and a bulb structure through which dilute acid can be poured which reacts with a metal sulphide in the base of the Apparatus. H2S gas then evolved collects in the middle dome from where it can be released through a leakproof stopcock fitted with a self lubricating PTFE plug. The base is provided with a residual outlet fitted with a cap for easy cleaning. We are Manufacturer Exporters and Suppliers of Plastic Kipp's Apparatus at wholesale competitive prices from India. KIAP 101 250 ML 1 Pc. KIAP 102 500 ML 1 Pc. KIAP 103 1000 ML 1 Pc.